This post is cross-posted at the Nonfiction Monday group blog. Please check it out to see what nonfiction bloggers are reading this week! 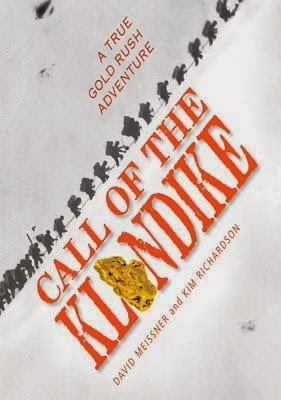 Call of the Klondike: A True Gold Rush Adventure by David Meissner and Kim Richardson. Grades 6 and up. Calkins Creek Books, October 2013. 167 pages. Review copy provided by my local library. Looking for an adventure? Pack your bags, bundle up, say goodbye to your loved ones (just in case) and join Stanley Pearce and Marshall Bond on their journey to the Klondike region of Alaska in search of riches beyond your imagination. In 1897, miners arrived back in Seattle with millions in gold, mined in the Klondike. Thousands of people then rushed to this remote area in hopes of making their fortune. It would NOT be easy. Using primary sources (letters, journals, and newspaper articles passed down within Stanley Pearce's family), David Meissner illuminates the hardships and risks of this fantastic adventure. Pearce and Bond spent thousands outfitting themselves for their journey and it took them months to even reach the Klondike. Before planes, before train tracks reached the area, adventurers had to travel by steamship to Alaska, on foot up the hazardous mountain passes, and by boat down rocky rivers to reach Dawson City. This is a fantastic adventure story and the author makes great use of the primary documents at his disposal. Excerpts from Marshall Bond's diary and letters from Stanley Pearce to his family give readers a play-by-play account of this dangerous adventure. Although Pearce and Bond are well-outfitted and maintain positive attitudes, many men and animals died in pursuit of Klondike gold. With temperatures dropping to 50 degrees below zero and food stores running low, not everyone who reached Dawson city returned. And less than one half of one percent of those who started the journey ever found enough gold to make them rich. This nonfiction book reads like fiction, including plenty of archival photos to give faces to the many who ventured to the north. Back matter includes an author's note, source notes, and resources for further information. The excellent use of primary sources provides exciting material that fulfills Common Core requirements for analyzing primary sources. Although it definitely has classroom applications, there's plenty of appeal in this story for thrill seekers and history buffs. Chasing Lincoln's Killer by James Swanson. The action-packed style of James Swanson's writing will please readers who enjoy true adventure stories that read like fiction, even though the subject matter and time period are different. The Call of the Wild by Jack London. Set in the wilds of the Klondike, Jack London's story is based on some of his experiences during the Klondike gold rush. In fact, Jack London met and spent time with Stanley Pearce and Marshall Bond and the fictional dog Buck was actually based on Pearce and Bond's dog Jack.